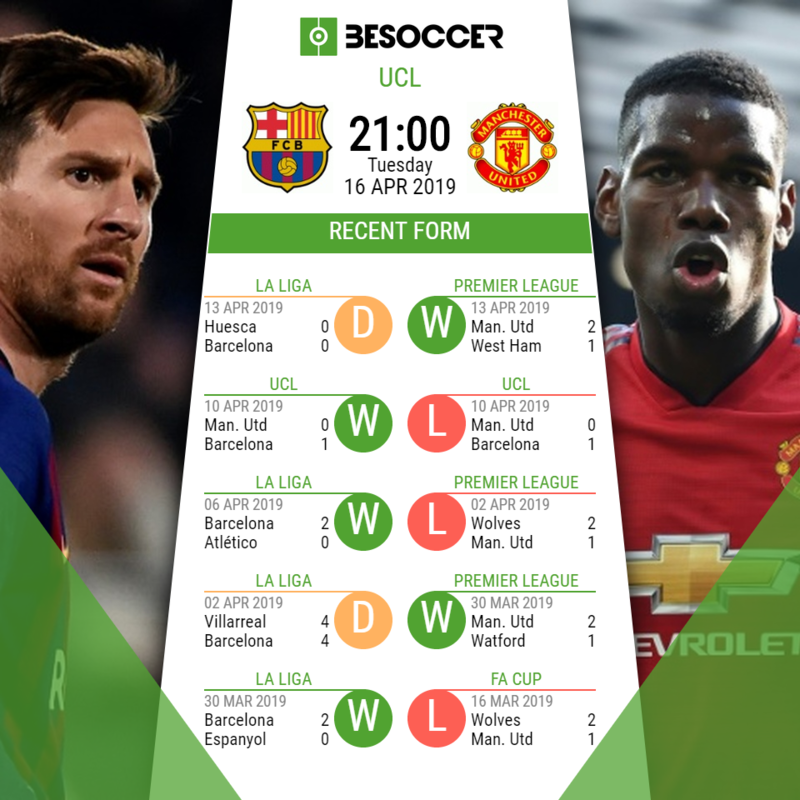 We look ahead to the Champions League Quarter-Final second leg tie between Barcelona and Manchester United at the Nou Camp, Barcelona have a one goal lead. Lionel Messi is due to be fit despite the nose injury he suffered in the first leg, whilst Sergio Busquets, Ivan Rakitic, Luis Suarez and Gerard Pique all missed the La Liga draw at Huesca in order to be ready for this game. Rakitic has had illness problems this week but it appears that he will be available to play this tie.Philippe Coutinho appears likely to feature again as Ousmane Dembele is lacking match fitness. Solskjaer made 5 changes to the team that defeated West Ham two days ago, with Scott McTominay and Marcus Rashford looking likely to return. Nemanja Matic and Ander Herrera have not played since the end of March, with Eric Bailly and Alexis Sanchez also lacking match fitness. Sanchez and Matic are both likely to feature in Barcelona, with Sanchez returning to his old club. Anthony Martial may also return in the second leg after a dire attacking performance at Old Trafford. "We can't be speculating. We will try to prevent them from scoring. We can't think we have an advantage. it's absurd"
"It's important who starts and who finishes. United has a special relationship with the last few minutes of a match. Here they won a European Cup in injury time"
"At the moment, of course, Paul's focus is on Man United and performing here and tomorrow night, He's been fantastic since I've come here and I've no doubt he'll perform as well as he's done lately, so I don't think they should worry too much." "No I won't, because it was against Bayern, it was a final, it was different. We will use the PSG match, we will use the Juventus game away, because we've beaten some good teams away from home this year and played against some great players." Ter Stegen; Semedo, Pique, Lenglet, Alba; Rakitic, Busquets, Arthur; Messi, Suarez, Coutinho. De Gea; Dalot, Lindelof, Smalling, Darmian; McTominay, Fred, Pogba; Rashford, Lukaku, Martial. "What happened to De Gea could happen to me as well"
Ter Stegen read one of Solskjaer's tactical notes during the game!